Enter a fantastic world of adventure! The Pathfinder Roleplaying Game puts you in the role of a brave adventurer fighting to survive in a world beset by magic and evil. Will you cut your way through monster-filled ruins and cities rife with political intrigue to emerge as a famous hero laden with fabulous treasure, or will you fall victim to treacherous traps and fiendish monsters in a forgotten dungeon? 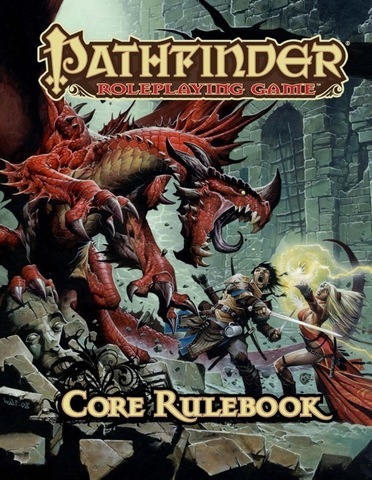 Your fate is yours to decide with this giant Core Rulebook that provides everything a player needs to set out on a life of adventure and excitement! This imaginative tabletop game builds upon more than 10 years of system development and an open playtest involving more than 50,000 gamers to create a cutting-edge RPG experience that brings the all-time best-selling set of fantasy rules into the new millennium.